On Saturday, I spent the first part of my morning building what can only be described as The Leaning Tower of Cookies. Unlike the other well-known tower in Italy, mine did more than just lean — it came down. I photograph most of the recipes I share on KLB at the end of my eat-in kitchen/office, on a table next to a window. For each shoot, I use natural light, a reflector, a diffuser, and a few props I choose carefully from my ever-growing collection. And while I like to take my time and get it right per se, there are days when I’m a little rushed — I need to set it up, get the shot and get everything cleaned up so I can move on to other plans. Saturday fell into the second category. The cookies you’re looking at barely had time to cool before I was stacking them and getting ready to photograph them. They began to crumble right away, and I only managed to capture them just before my tower toppled. I had a dozen more cookies waiting in the wings but decided to roll with this shot — they just look so delectably real and inviting. This shot makes me feel like there’s a party or a picnic going on, people are present, and you could reach right in and grab a cookie to eat, or at the very least pick at the crumbs. I should probably mention that those are Peanut Butter Chocolate Chip cookies. And that the peanut butter was playing a supporting role in the crumbly-softness factor (I was a little heavy-handed with it when I made the dough). Aside from being soft and crumbly, they were melt-in-your-mouth, incredibly rich and indulgent — I know because I tasted more than a few! If you’d like to make your own crumbly chocolate/peanut butter indulgence, and maybe even your own Leaning Tower of Cookies, read on for the recipe. To start: Preheat the oven to 375°F. Line 2 cookie sheets with parchment and set aside. In a small bowl, combine the flax meal and water, and whisk with a wire whisk or fork until it thickens to a consistency similar to beaten egg whites (it will thicken and become gooey, and this is your egg replacer); set aside. Prepare the cookie dough: In a large bowl, beat the Earth Balance and sugars together with a handheld mixer until creamy. Add flax meal/water mixture and vanilla, and beat until smooth. Add peanut butter and continue to beat until combined. Sift in flour, baking powder and salt, and stir with a wooden spoon until combined. Add chocolate chips and fold them in with a rubber spatula. 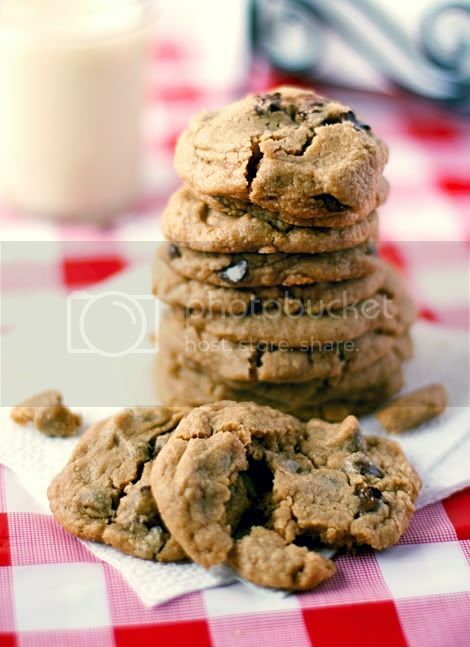 Bake the cookies: Take dough by small spoonfuls and roll loosely into balls. Set them on cookie sheets and lightly press the balls down with the palm of your hand (you should get a dozen per sheet). 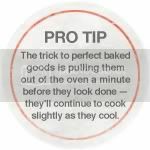 Bake for 12 minutes or until just golden on top — oven times vary, and it's important to take them out while they're still soft, before they start to brown, to avoid over-baking. Remove trays from the oven and allow cookies to rest on the sheets for 1 minute before transferring to a wire rack or countertop with a spatula. Serve with plenty of ice-cold, sweetened almond milk. There is no better structure than a tower made of cookies - except maybe a bridge of biscotti! Can I pinterest this site? It's definitely ok to pin recipes from this site to your pi board with proper credit and a link back to the post you're pinning.